Lines of the Trans-Siberian Railway, from Library of Congress at loc.gov. The United States and Canada built the world’s first continent-spanning railways. It would not be long until Russia did the same. But while the U.S. and Canadian routes were designed to improve national internal communication, Russia’s idea was different. The czars (the word is derived from the Latin Caesar) saw the link as a way to create added routes within their empire to connect Russia with Europe and Asia. It could be said that while other national railways looked inward, Russia’s looked outward. It was Czar Alexander II who began what would be one of the largest rail-construction projects in history (7500 kilometers or 4960 miles); his son Czar Nicholas finished the job 12 years later. The route became high priority when the port of Vladivostok opened in 1860 and an overland passage from there to Moscow and St. Petersburg was needed. In addition, Siberian territory was eyed for development by the military. 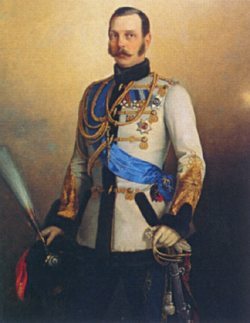 Czar Alexander II, from alexanderpalace.org. A final note followed, written by a father to his son. When Czarevitch Nicholas, heir to the throne, arrived via travels in the Far East, at the port of Vladivostok, he received the official declaration of the decision to start the project in a personal note sent by his father, Czar Alexander III. Nicholas launched the construction of the railway i in Vladivostok immediately. It is noteworthy that he conducted a religious ceremony. On that first day, Nicholas placed a symbolic first stone in the route, and later silversmiths from St. Petersburg were commissioned to fashion a commemorative plate. 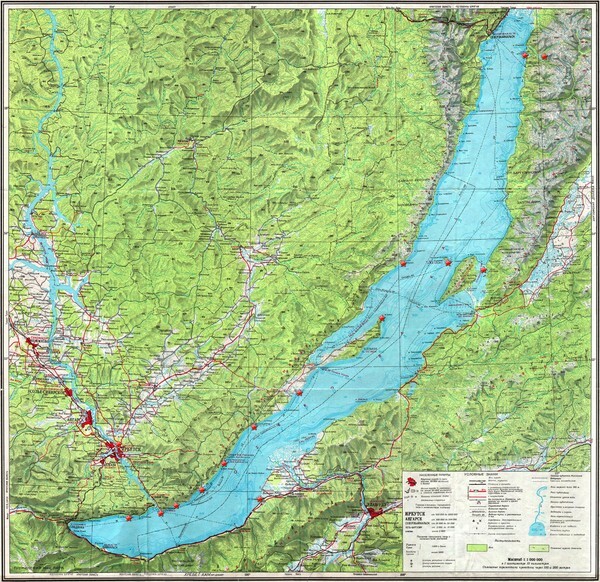 Lake Baikal is a huge lake, the size of Switzerland. Unfortunately for the 90,000 laborers on the Trans-Siberian Railway, the lake lay right on the path of route construction. A lake whose depth was 1620 meters (5340 feet) demanded a boat to traverse its length. This was a distance beyond the capability of bridging. England designed an ice-breaker boat. But when the Russians bought it, they forgot to ask about delivery. The vessel was too big to ship. When the parts were transported in pieces, then rebuilt on site, some were missing. The Russian shipwrights got creative. Train tracks stopped right at the edge of the lake where passengers embarked upon the vessel to crossed the water. Then, they boarded another train at the other end of Lake Baikal. During winter’s deepest cold, sleighbells jingled as horse-drawn sleds slid thrilled passengers across the ice. Meanwhile, a rail route was constructed around the southern side of Lake Baikal requiring 200 bridges and 33 tunnels. Like Hoover Dam or Snowy Mountains Hydroelectric, the project hired legions of workers. Soldiers joined in throngs; having field work skills and team values, they were especially welcome. But convicts were also hired. Cities hosted job fairs. Many hands were needed; more than 20,000 people labored on one particularly challenging section. More than 90,000 people worked on the Trans-Siberian Railway. The railway was quite successful, so much so that just three years after it was completed in 1904, there was talk of an additional track. It was clear that improvements were needed; for example, during the Russo-Japanese war in 1904, 333,000 tons of coal were stalled in Archangel awaiting shipment. Vladivostok was even worse: cargo worth US$1 billion sat gathering dust near the harbor. Backlog for transport was so serious that the harborside was strewn with piles tarped over awaiting their turn on the railroad. In some instances, supplies languished unshipped for as long as two years. Could things get worse? Apparently the government was not able to cope. Then, the whole system collapsed; the czarist government fell. The United States saw an opportunity. Recognizing the new regime, it offered to help upgrade the railroute. Soon, a loan of US $100 million was on the books. But there was more: John F. Stevens, engineer, who arrived in Russia, conducted inspections, and declared the existing tracks were in good enough condition to merit the considerable investment in improving the route. A few days later, George Emerson, a rail executive in private industry, received an urgent note to come to Washington, D.C. immediately. With no idea what was to befall him, Emerson was told the future of world peace lay on his shoulders and he must select a team of 300 from 2,000 candidates among whom were some of the finest rail engineers in America. In 1917 Russia and the United States entered into a cooperative agreement: 300 with Emerson’s 300 and the Russian engineers. The Russian Railway Service Corps was formed; American and Russians worked side by side to improve one of the world’s most important transportation routes. Each American’s salary was sent home to their families while the engineers lived on Army rations in field barracks. Later, all who served in the corps were honored with a U.S. Army commission. The Trans-siberian route remains critical. Revenues are impressive; in 1989, container shipping produced profits of US$2 billion. Trans-Asia commerce will continue to grow. Linking the Trans-Siberian Railway to Japan and Korea is also a possibility. Two expansions are possible: to Japan via Sakhalin Island and to South Korea via North Korea. Is it time for a world standard on rail track? Korean rail width is different from Russians, but neither matches European rail. But the most intriguing possibility for innovation could be idea for an expanded Trans-Siberian. High-speed rail such as maglev can only be effective when trains can zip along vast stretches of uninterrupted terrain to reach highest possible speed. If the Trans-Siberian were thus improved, benefits could be quite considerable and may be worth immediate study. Your Imperial Highness! Having given the order to start building a continuous line of railway across Siberia, which is to unite the rich Siberian provinces with the railway system of the Interior, I entrust you to declare My will, upon your entering the Russian dominion after your inspection of foreign countries of the East. At the same time, I desire you to lay the first stone at Vladivostok for the construction of the Ussuri line, forming part of the Siberian Railway, which is to be carried at the cost of the state and under direction of the government. Your participation in the achievement of this work will be a testimony to My ardent desire to facilitate the communications between Siberia and the other countries of the empire, and to manifest My extreme anxiety to secure the peaceful prosperity of this country. I remain, your sincerely loving Alexander. -From A.I. Dmitriev-Mamonov and A.F. Zdsiarski, eds. Guide to the Great Siberian Railway with 2 Photographs, 360 Photo-gravures, 4 Maps of Siberia, and 3 Plans of Towns, translated by L. Kukol-Yasnopolsky, revised by John Marshall (St. Petersburg: Artistic Printing Society, 1900), p. 62. See Davidson and Lusk Brooke, p. 313-4.
International Railway Service Corps: The Trans-Siberian Railway introduced what might be the world’s first rail service corps when Americans and Russians worked together in 1917 to revitalize the railway through the Russian Railway Service Corps. Could this example of technical and cultural collaboration inspire a future International Railway Service Corps to develop magnetic levitation technology for a new world rail system? Trains and Diplomacy: Trans-Siberian could connect a Seoul-Moscow-London line, via North Korea. What are the international technical, political, and cultural issues? Dmitriev-Mamonov, Aleksandr Ippolitovich, and Anton Feliksovich Zdziarski, eds. Guide to the Great Siberian Railway with 2 Photographs, 360 Photo-gravures, 4 Maps of Siberia, and 3 Plans of Towns, translated by L. Kukol-Yasnopolsky, revised by John Marshall (St. Petersburg: Artistic Printing Society, 1900). Reprinted by David & Charles Reprints. Newton Abbot: David & Charles, 1971. United States Congress. Providing an Honorable Discharge for the Members of, from the Military Service of the United States, Hearing before the Committee on Military Affairs, House of Representatives, Sixty-Seventh Congress, Second Session. Russo-Japanese war was in 1904-1905, not in 1914.